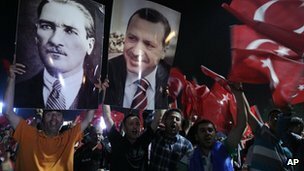 In Turkey tens of thousands of people have taken an active part in protests, voicing their anger at what they see as the increasingly authoritarian government of Prime Minister Recep Tayyip Erdogan. But he won a landslide at the last election and still has high levels of support across the country. This weekend there are expected to be big rallies backing the prime minister. Here, some of his supporters give their views on the current crisis. Read more . . This entry was posted in Gezi Park protests, Recep Tayyip Erdoğan, Turkish economy, Turkish politics. Bookmark the permalink. It is sad to hear that me and the hundreds of individuals whom i know are not ordinary Turkish people. I guess you also think that we are minor marginal vandals. With all due respect Mr. Scott but you are commenting and evaluating the situation and process under the rule of AKP too naively. Thanks for your input, Ender. I guess I have been listening to both sides of the story since 2003 – as well as making my own observations since I first came to Turkey in 1995. In those days, you couldn't say the word 'Kurdish' in public. In 2001 it cost 1.5 million TL to get on a bus or buy a newspaper. The country had been ruled for years by ineffectual politicians representing a small minority of the electorate, hiding behind the threat of military intervention. Certainly Turkey is not the perfect democracy, but I believe Turkish people should be proud of their country's achievements in 2013. I believe that Atatürk would certainly be proud of the republic he founded. As an Alevi Turkish citizen , i still can not say freely i am an Alevi. Kurdish ethnicity is just a political movement for the government since their hatred relatively based on religion apart from races. And when it comes to Bright economical growth of Turkey, i am not an expert about it but clearly i can see that there are too many undervalued privatisations of the state facilities and short term bank depts which lead money flow to Turkey in sooner but will cost more than gianed in the future. Speaking of media, you have mentioned that mainstream media is freely critising the government. It is not my duty to advice you, but maybe you could try to pay more attention how they cut the broadcasting right after police starts to use excessive force or how they locate their cameras perfectly when it comes to show that so called protestors throwing molotov coctails. And also what do you think about especially the construction biddings which are always being won by the companies owned by the relatives of ministers and government workers, so on.? Ender, I really appreciate your taking the time to read and comment on my blog. In fact I don't support any political party, and I am not eligible to vote in Turkey. Two things motivate me to write this blog. One is my feeling that citizens of Turkey don't always appreciate their own country and its achievements – and second, that people abroad have many misunderstandings about Turkey, and they want to believe that the country is backward and undemocratic, and an Arab/Islamic dictatorship like Syria, Libya which is now descending into chaos. In fact, most of those so-called democratic Western countries have similar problems of unrepresentative governments, excessive privatisation and police suppression of protest. I have a request to make. Would you be interested in writing a piece for me about the Alevi faith and the situation in Turkey that I could post here or use as the basis for a post on the subject? We can keep it anonymous if you prefer. If you agree, I can supply an email address. Currently i am on my vacation in Turkey but i live in Estonia almost for a year. Even such a far country citizens have prejudgements for Turkish people and as well as the state. I totally understand your point of view. Yet it is a self education or being open minded issue. I can not tell them Turkey is being ruled by a perfect democracy or i would not hesitate to tell them there are unfair trials, laws or corruption in the country moreover i would definitely not hold myself back to protest the situation on a legal basis. On the other hand i labeled myself as Alevi Turkish because that is how i feel but originally i am Nusayri from Antakya/HATAY. And i do believe there are differences between Anatolian Alevis and Nusayris however i have never been a religious person and did not practice the rules. So i might not be the perfect info supply about the faith principles but i could answer your questions as much as i can do. Ender – I have been trying to understand Turkey for 18 years, and I learn something new almost every day. I wrote a piece about religion in Turkey in February 2010 which you may like to take a look at: http://turkeyfile.blogspot.com/2010_02_01_archive.html I would definitely like to follow it up with something more detailed about Alevism. I'll think of some questions and forward them to you. If you mail me at strawberryfeelds01@yahoo.co.uk we can communicate better that way.